Ofcom has today awarded local TV licenses to Bay TV Clwyd and Bay TV Swansea, who will now launch local TV stations on Freeview in south west and north east Wales. The stations join Made In Cardiff, which until now was the only local TV station licenced in Wales. Last year, Bay TV won its first licence for its Liverpool local TV station, which is expected to launch later this year. Bay TV Clwyd has obtained the group's second local TV licence, covering neighbouring Mold in North East Wales, and will broadcast from the Moel Y Parc Freeview transmitter site. In its application for the licence, the station has committed to broadcasting local programming in English and Welsh, outlined a partnership with Glyndŵr University and expressed a desire to extend coverage to Wrexham during its licence period. It has confirmed that some material will be shared with its neighbouring "big brother" station Bay TV Liverpool. 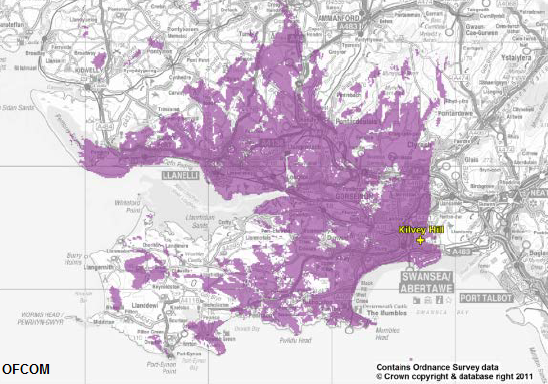 Bay TV Swansea meanwhile will broadcast to viewers around Swansea Bay, including Llanelli from the Kilvey Hill transmitter site. The station will also broadcast programmes in English and Welsh. In its application, Bay TV Swansea said it would broadcast an hour long news show in the evening, with more in-depth coverage of local politics, current affairs, arts, entertainment, local history and geography and sport provided "through a series of themed programmes". With regards the other Bay TV services, John Curzon, director of programmes-designate for Bay TV Swansea confirmed to the South Wales Evening Post that "the two companies are separate but we will share expertise across north and south Wales. We will also work closely with Bay TV Clwyd on Welsh Language programmes for both areas." Both Bay TV Clwyd and Swansea have been allocated Freeview channel 26, as channel 8 - used in England and Northern Ireland for local TV - is already assigned to Channel 4 in Wales. The transmission infrastructure is being operated by local TV multiplex licence holder Comux. Seemingly no quality threshold for these bids then. The Bay TV Clwyd bid for Mold is actually ran from Liverpool and features just 2 hours of local content a week plus three 15 minute local news bulletins (2 at weekends), with the rest of the schedule being "As Bay TV Liverpool". You then look at the Liverpool schedule which includes Euronews all morning and Teleshopping throughout primetime. These channels really should have been given out on a regional basis to give them a chance - a channel for Wales with local opt-outs would have been a far better option.